Interview: Nick Park CBE: Wallace & Gromit | How Did They Do It? “I always felt they had to be in pairs so Walter the Rat had a pet worm which was the victim really when it came to fishing”. Today Nick’s feature films have multi-million pound budgets backed by some of the biggest names in Hollywood but his first characters were made of a product called Fuzzy Felt and inhabited a world based in his parents’ backgarden. He began making films aged 13, mostly short sketches involving comedy duos such as Walter the Rat and a friendly worm, or Murphy and Bongo, a caveman and a dinosaur. Many filmmakers have had their first experiments in film at a young age but with Nick’s work there is a noticeable continuity between some of the thinking behind the films he made in his teens and what became Wallace & Gromit. His father was the first to note the trademark humour in his short films and encouraged him to go to film school. A real lightbulb moment happened at a film festival where Nick had the idea of combining the kind of humour found in Looney Tunes, Tom & Jerry and Disney cartoons with plasticine animation. Working with plasticine is a notoriously painstaking process. At Aardman Animations, the Bristol-based animation studio for Wallace & Gromit, the production teams rolled out roughly two minutes of footage every week, even when using 25-30 units of animators all working simultaneously. It’s a process that Nick himself has found testing, the first Wallace & Gromit film, A Grand Day Out, which started as his graduation project, took seven years to complete. As well as having the stamina needed to work with clay, Nick is an obsessive character who never stops dreaming up new sketches, endlessly doodling on a notepad. Rarely in animation, or film in general, does so much of the creative work originate from one individual. As well as directing, writing and producing the Wallace & Gromit, Chicken Run and Creature Comforts films, much of the set design, “costume”, accents, even the colour of the socks are mostly determined by Nick. He would be the first to say that animation is a collaborative effort, with ideas coming from many sections of the team at Aardman, but most of the core ideas come from Nick. He was born and raised in Preston, Lancashire, where he attended Cuthbert Mayne High School. He is a graduate of Sheffield Polytechnic, now Sheffield Hallam University, and the National Film and Television School in Buckinghamshire. He is the recipient of four Academy Awards and five BAFTA Awards and until 2010 he had the rare accolade of winning an Academy Award in every year he was nominated. He is also a recipient of the coveted gold Blue Peter badge. You first picked up a camera at the age of 13, what were your first films about and how did you approach putting them together? I was about 13 and my parents had this home movie camera that could do single frames. Art was the only thing that I was good at really and I could draw cartoons. I didn’t know much about how to make animated cartoons and I found it quite hard to find out but my dad was a photographer and he told me some of the basic principles of how animation works and I turned some of my early cartoons into animations. I didn’t have the technology to do cel animation like they do at Disney, so I went very low-tech. My first film used something called Fuzzy Felt. My mother is a dressmaker and she always had scraps of felt so I made my characters into felt cutouts and moved them on a board which was the background. I made up a story for a character called Walter the Rat and created The Rat and the Beanstalk. It took me a day to shoot. Which reminds me, I was quite obsessed with this Walter the Rat and I tried to do a drawn animation version which never came back from Kodak. So there’s a lost film somewhere! We’ll have to get the BFI to chase it. Yes we will! Because it didn’t come back I tried something a bit quicker, using Fuzzy Felt. Then I tried something with puppets called Walter Goes Fishing. So I made half a dozen films just like that at home really. I know the storylines weren’t particularly deep at this stage but is there any noticeable continuity between the themes that we now see in the Aardman films, such as the humour, or the setting? There probably is, I don’t know in what way but the beginnings of what I did with plasticine did exist and I remember my dad picking up on the humour. That’s what gave me a lot of confidence in the storytelling and the characters, that I could make people feel sad or make them laugh. I didn’t realise this at the time but a lot of the characters I created were duos, like Wallace and Gromit. It comes from watching things like Laurel & Hardy and Tom & Jerry. I always felt they had to be in pairs so Walter the Rat had a pet worm which was the victim really when it came to fishing. I had another set of characters which no one has ever really seen called Murphy and Bongo, which was a caveman and a dinosaur character. It’s interesting how that has carried through. After school you studied Communication Arts at Sheffield Polytechnic before going to the NFTS, a very elite film school, and then to Aardman Animations in Bristol who were mostly working on commercials. How did your career develop during those years to the point where you got involved with Aardman? That’s quite a long patch really but I’ll try to sum it up. I always thought this would be a hobby really, forever, because coming from Preston in Lancashire, I had never heard of anyone going into the film business or TV so it wasn’t on my radar as something I could do. I did a foundation art course at A-Level standard in Preston and there it was suggested by my dad that I should do a degree course in filmmaking. I went to Sheffield and made a couple of short films and with that applied to the National Film and Television School It was while I was there that I created Wallace & Gromit, which was my final year project. As it turned out it wasn’t my final year project as it took me seven years in total to complete! I met Peter Lord and David Sproxton from Aardman during the course. Yes, it was, I was working on Aardman projects part-time so it was taking ages but it was great the way it worked out and I have stayed here ever since. Where did the characters of Wallace and Gromit, particularly Wallace, come from? It must be connected with the duos you were working on in your early films? Yes there were many inspirations. One of the reasons why I have gone for model animation, because I tried all sorts of techniques at college, was I just liked the way it was like a real film in that you use a camera, lighting and there’s a physical set. I also loved comedy and cartoons so you get the best of both worlds. I tend to refer to my childhood a lot and things I remember from my parents’ house or my granny’s house. I often refer to things I saw, like the tea tray or the wallpaper, or the gnomes in my granny’s garden and the shapes I remember as a kid which were attractive and interesting. The shape of the rocket in A Grand Day Out is influenced by cartoons like Tintin and films like H.G. Wells’ First Men in the Moon. Wallace is said to be based on my dad but I discovered that in retrospect. One of the other interviewees for this series is Catherine Johnson, the writer of Mamma Mia!, who is also based in Bristol. She was telling me that she has lived a lifelong process of observing things, soaking stuff up from her friends or wondering around in public and it translates into a story later almost without realising. She’s always thinking about stories and jotting ideas down, is that a similar scenario for you? Definitely, always, you never switch off. I’ve always got a sketchbook handy and even if I’m watching TV or on the phone, I’m still doodling. My mum has always said that while I was a kid I was the quiet one, always observing, and I would love to go off drawing on my own, they were my happiest moments. She said I would stay on the phone and observe people, like Gromit, she would say. Turning to A Grand Day Out again, you said some of that was inspired by your family both in terms of the characters and the setting, which is clearly Preston, the humour is in there as well. Did you just collect up all your ideas and go, “right I am just going to do what makes sense to me and like-it-or-lump-it as to whether anyone else will enjoy it”? Did you think about whether it would have wide appeal, because the risk would have been that it could have turned out quite narrow and eccentric? It turned out, of course, to be very popular. It was partly the beauty of being at college really, that I was free from commercial pressures. I was always aware of audiences but to be honest from the beginning I have just wanted to make films that I would personally find entertaining and draw from all the things I loved when I was growing up. It was things like animations in kids’ TV, Disney, Laurel & Hardy, Indiana Jones, European films, all mixed up. I’ve always wanted to make my own mark and when I started A Grand Day Out, I hadn’t seen anything like it in that I hadn’t seen a movie made with puppet animation or cartoon rules in a 3D world. I remember being at an animation festival and there were so many quiet, serious and obscure art films on but part of the festival was showing Chuck Jones’ [Looney Tunes creator] films like Daffy Duck and Bugs Bunny which I really enjoyed and I came out thinking, “no one has ever done that kind of humour in clay animation, so that’s what I am going to do”. I do like audience reaction but it’s hard to keep a perspective on what you are doing. If you’ re working on a feature that takes four or five years to complete and you think up some joke at the beginning, you then have to stick with it for the duration and you only see a reaction four or five years later, you can start loosing confidence in the jokes. I suppose if you are spending so long on one project you can over-think it. You start to question everything. The only people watching it while it’s being made are the edit team and people working on the sound and they have all seen it a million times and half way through production no one is laughing any more. In the final mix you have seen the film about 300 times and everyone has stopped laughing, you start to think it may not be funny. I remember thinking that about The Wrong Trousers, thinking I wasn’t sure what I had made. I wasn’t sure if anyone would like it, quite honestly. I was quite bowled over when I went to the premiere and had the first reaction. Thinking about the length of time it takes to produce these films, what are the mental effects of working with plasticine for so long. In the 1996 Australian current affairs programme, 60 Minutes, you said working with plasticine might be compared to giving birth in terms of the pain of the process, is it just that 25 frames-per-second is tedious or are there other aspects to it that are tough? The slowness is all part of it but it’s also about being a bit of a perfectionist and finding it hard to let things go. I have worked with a wonderful team that understands this area really well so a lot of things are happening automatically now but I still like to be involved in every frame and every process from the storyboarding, to the design of the characters, I feel I know what colour the socks of every character should be. The bits I don’t really know enough about are the music and sound effects, although obviously I am looking at them and approving them all the time. For a feature film, to get it done on schedule you are shooting a lot of scenes at the same time so it’s all got to be storyboarded so you know where you are at any one time. It’s quite a massive undertaking to keep an eye on it all. When you do have a vision for what you want it to look like, as you’ve described, but you are working with a huge team of technicians, animators, and also pressure from finance and potentially America on some of your feature films, how do you keep creative control in that environment? Especially as you are on the quieter side personally and film is traditionally thought of as quite an aggressive industry. I have done two feature films now, Chicken Run and The Curse of the Were-rabbit, there were massive learning curves both in terms of making full-length feature films and working with other studios, with Dreamworks. Jeffrey Katzenburg, from Dreamworks, had a huge appreciation for what we do here, I felt I was treated very well, I am not a person who naturally cracks the whip and refuses to come out of my trailer, though some of the plasticine models do. It was a learning curve but it was a case of learning where your real battles are, which battles to fight and which to leave. It was also important to know which areas they know a lot about, like the marketing and the music that will make it a big success in the cinema world. It was give and take really, with Wallace & Gromit it was easier because I had already made three shorts and I could say “Wallace would not do that”. With those films we were trying to stay true to our own culture and sometimes the Americans wouldn’t understand the accent or a turn of phrase so sometimes we had to compromise a little, but we pretty much dug our heals in. Jim Henson said one of his main motivations was making as many people as possible happy. What would you say are your main motivations? I think I would say I do like making people laugh but I also want to move them as well. I know it’s comedy but I do want to make something meaningful, but I do see comedy as meaningful actually and being a great tonic. I think I want to tell a good story that makes people laugh and moves them. The reaction that a lot of people have towards your films, particularly Creature Comforts and Wallace & Gromit is “oh, I wonder how they came up with that?”. What is the development process like for one of your productions because I am guessing it is less formulaic than the approach you might take within a television production company or an ad agency in terms of how you go about creating new ideas? At Aardman we pride ourselves on being original and not being formulaic, we do have to have a stamp of originality in it. We have a development team now and a number of different creatives and directors that are eager to make films. I personally feel kind of spoilt because I can mention an idea and everyone listens, I don’t know how long it will last! Everything goes through some kind of evaluation and there are lots of ideas here that don’t get taken up. If we are genuinely finding it funny then we hope other people will too. If you make it for yourself then that is how it will appeal to others but if you try hard to fit a perceived market you might miss badly. 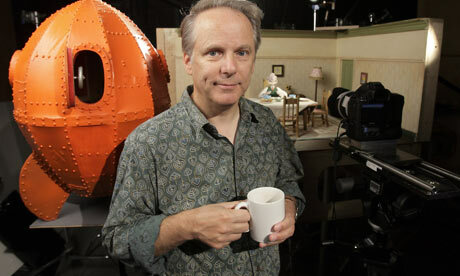 Pingback: Wallace & Gromit creator, Nick Park, on how he made it in film | How Did They Do It?